You Self-Employed superheroes have enough on your plate without worrying about the changes each year brings to tax rules and legislation. That’s why we’ve gone ahead and looked at the changes you’ll need to know about for 2019. It’s almost hard to believe that in 2019 tax isn’t digital already! But don’t worry too much, MTD only applies to VAT registered businesses with taxable revenue over £85,000 now and only on their VAT returns. Even better news for those of you who work with us already – you’re MTD ready. If you’re our customer and you use our free app, you’re MTD ready so you’ve got nothing to fear! After the implementation of IR35 legislation in the Public Sector was a little challenging, the implementation into the private sector has been pushed back until the 2020 tax year – at the very earliest. Just about everyone will benefit from an increased personal allowance that will come into play in April of this year. Most people’s tax-free allowance will now increase to £12,500. The national living wage will be increasing by 4% to £8.21 too. These two changes combined should provide relief for lower income families. If you’re a small retail business you’re going to be pleased to hear that your business rates will be slashed by a third for 2 years. This is the government’s attempt to provide some assistance to the struggling UK high street. The final change that we’ve earmarked for the Self-Employed is the entrepreneur’s relief. After the 6th of April 2019 you’ll be able to benefit from a reduced capital gains tax on assets you dispose of. So long as you’ve owned the asset for more than 2 years you will receive a reduced 10% capital gains tax rate. There’s a lot of change in the uncertain political environment and we’re sure you’ve got your hands full. That’s where Your Sidekick comes in, we’re more than just accountants – we’re business partners. 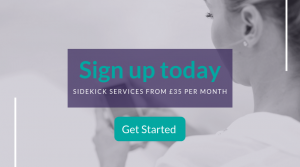 To find out how we can help you from as little as £35 a month contact us now.